​It was inevitable, but now it's officially official. After an historic freshman season for the Duke Blue Devils, phenom ​Zion Williamson announced he has declared for the NBA Draft in an emotional Instagram post on Monday evening. 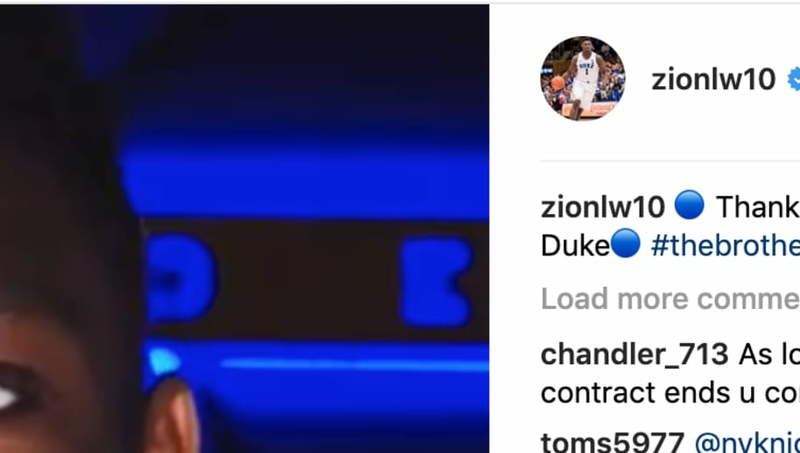 Zion thanked several people in the video, including his mother, coach Mike Krzyzewski, and Blue Devil Nation for their undying support. Barring the most absurd of circumstances, Williamson will be the No.1 overall pick on June 20 where the Knicks, Suns, and Cleveland share the best odds to land his services. Zion was simply a ​walking highlight (and bucket) this past season, willing his Blue Devils to a spot in the ACC Championship game and an appearance in the Elite 8. Zion Williamson is declaring for the NBA Draft. Williamson is just the 3rd freshman to win the Wooden Award, joining Kevin Durant and Anthony Davis. He shot 68.0% from the field, setting a Division I freshman record. The 18-year-old averaged 22.6 points and 8.9 rebounds while shooting 68 percent from the field, including an otherworldly 74.7 percent from inside the arc. Additionally, Zion took home the prestigious Wooden Award and was named the Player of the Year by the Associated Press. He now joins former teammates RJ Barrett and Cam Reddish, who recently decided to forgo their remaining years of eligibility and enter their names in the ever-growing pool.